Patisserie Sadaharu Aoki Paris’ flagship store in Tokyo is located in Tokyo Midtown, right in the heart of Roppongi, which is by itself in the core of this metropolis. Tokyo Midtown houses quite a number of interesting places for foodies and dessert lovers to visit . 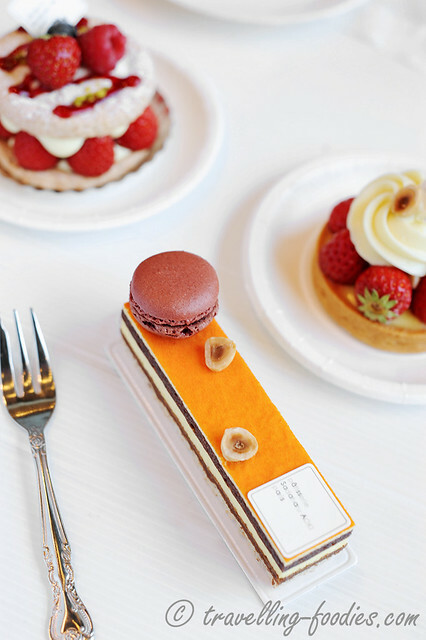 Apart from Sadaharu Aoki, there is also Jean Paul Hevin, Henri le Roux, Maison Kayser and Toshi Yoroizuka just to name a few. Even a premium fruits store, Sun Fruits has a good selection of fruit themed cakes available. For the more Japanese inspired, there is Toraya, Kyo Hayashiya and Asanoya. One of our favorite burger joints Baker Bounce is also there and not to mention Dean and Deluca, as well as Precce Premium Supermarket! 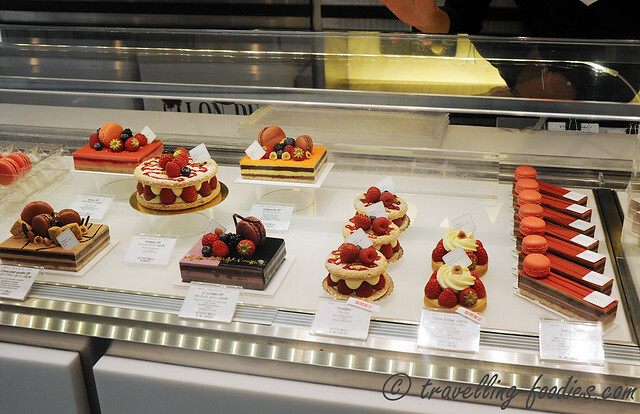 A familiar sight to those who have been to Patisserie Sadaharu Aoki Paris outlets. 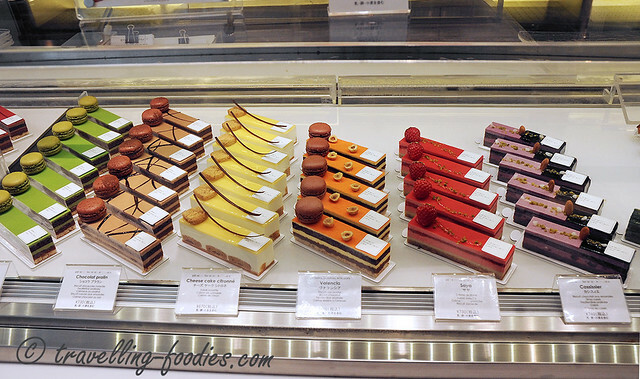 The selection available seemed rather “standard” of his entremets but still a pleasant sight to behold. More from the chiller display, with Senseuille on the extreme right which was created in 2012 for Formosa Regent in Taipei. As well as some new items for the season and larger cakes. Opt for takeaways (or “takeouts” as what the locals are more familiar with) instead of enjoying them within the comforts of his dessert salon which has seating available actually, for a multitude of reasons. 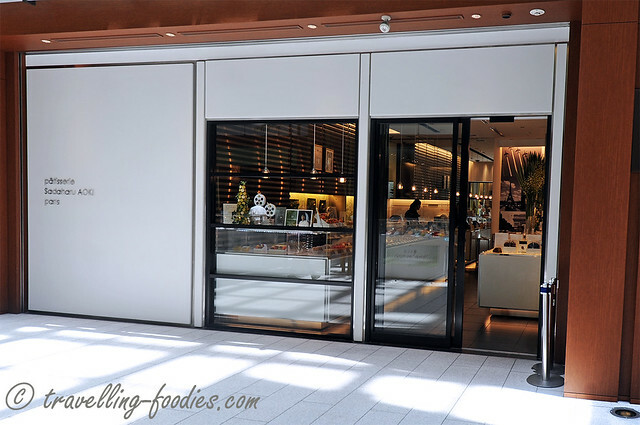 (1) the lighting isn’t really conducive for photography inside, as with many patisseries we’d visited, (2) without the dine-in 10% “service charge” imposed, it is relatively cheaper to takeaway instead. Yes we are cheapos! (3) the Tokyo weather was a really comfortable 24-25 °C when we were there, so it made lots of sense to dine al fresco, given the availability of open air seating around Midtown! (4) To really honest, I think dining in and photo-taking within the dessert boutique could be quite a daunting affair. Aoki imposes a rather strict “no photography” policy, just like Patisserie Hidemi Sugino and some of the other Tokyo pastry shops we’d visited. I think I would rather live without the stress and happily snap away as much as I could for as long as I want outside the ever watchful eyes of Aoki’s shop attendants. Less stressful for both them and me! There were two new seasonal items available and we chose them both! Fraisier is a pretty little fella. I’m surprised to see that unlike many other pastry shops which opted for the more conventional Japanese-style strawberry shortcake, which is ever-popular amongst the Japanese ladies. But Aoki has never been known to be conventional. 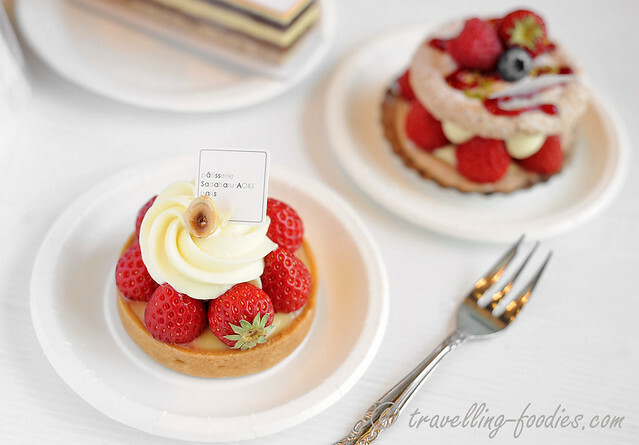 In fact, that was what brought him into attention and limelight in the first place more than 2 decades back in Paris, where he incorporated Japanese ingredients like matcha, black sesame and yuzu into classical French pastry making. 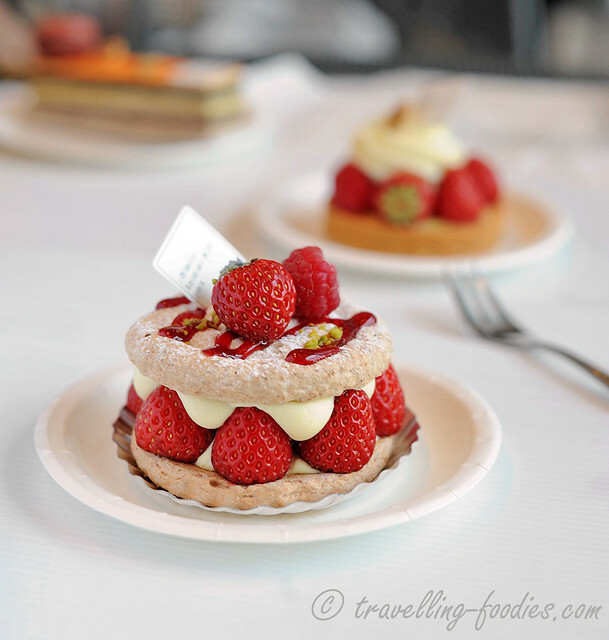 Fraisier has a rather simple composition of crème diplomat and fresh mara des bois strawberries sandwiched between layers of biscuit dacquoise. The flavours blend in really well with each other. Using crème diplomat was an excellent choice. It marries crème chantilly with crème patisserie, allowing the final product to have a good amount of richness but without having too much heft. It remained rather refreshing but yet tasting robust at the same time. 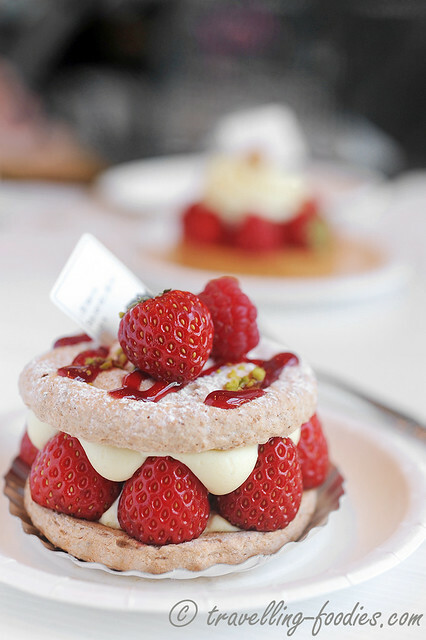 The dacquoise was good too. Lovely nutty aroma from the almond and probably hazelnuts used without being cloyingly sweet, unlike say what a macaron would have produced. On the whole, the simplicity of the work really allowed the fresh strawberries to shine! Sadaharu Aoki’s Tarte Citron is an old friend by now. We have tasted it on several occasions and it remains one of our favorites. The lemon curd cream filling was perfect in texture and balances the right amount of tart flavours with sweetness. The pate sucree tart base was also very well-made, standards consistent with what we had tried in Taipei, if not even better. The crust is uber thin but yet permeates a full-bodied buttery aroma which nicely bridges the chocolatey nougatine layer at the base with the soft and smooth lemon cream. Yes, Aoki’s Tarte au Citron is “unique” to have incorporate a chocolate and nut component which is literally unheard of in French lemon tarts. I remember reading about it causing quite a upheaval in Paris when it was launched. Some loved the innovation while the purists loathed it. It certainly worked very well for me to break the monotony of the lemon cream filling. 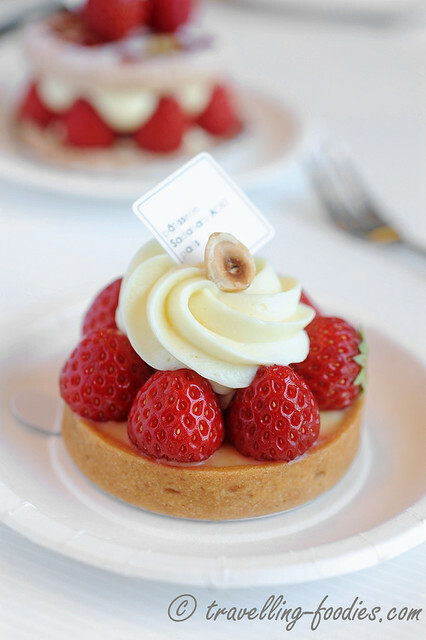 The “et fraise” component is purely seasonal but adds such a delicate touch to this French classic. But I most certainly didn’t mind as the strawberries are so fresh with a melange of mostly sweet and a hint of sourish flavours. This is nicely contrasted against the rosette of crème diplomat above. Despite the additional components, flavours are still kept clean and well defined. And of course, the presentation is impeccable. Yet another familiar favorite, Aoki’s signature “Valencia” which celebrates the matrimony of orange with chocolate. Like the Tarte Citron, we’d had it several times before. I’d also attempted to make it once. Yet it looks different now. So different that I did not recognise it initially. The sugar decor with kumquat confit is gone, and with it much of the dramaticism of the piece! I was very much looking forward to original Valencia actually, like meeting an old friend again. 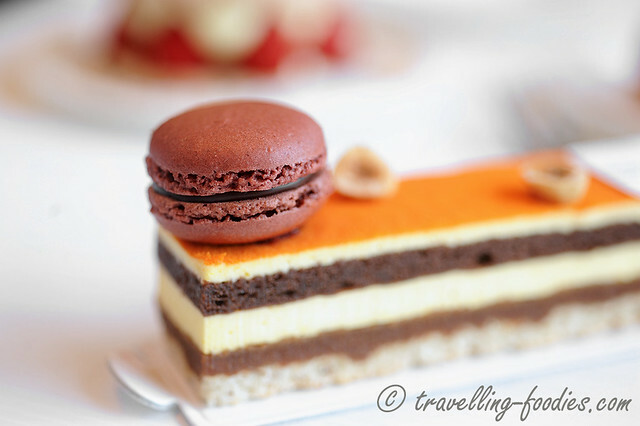 A macaron au chocolat noir now sits where the fan-coral shaped sugar decor once did, somewhat “normalised” to look like some of the other Aoki creations like Chocolat Praline and Macha Azuki. Apart from the decor items, the layering of the entremet also looked much neater now. The “old Valencia” had layering contours which seemed more undulated and somewhat more natural to me. It seems that over the years, Aoki has decidedly gone for cleaner lines in his works over his more “free-style” presentation as one would have observed in his Valencia as well as older works like “Fuwa Fuwa“. The top most orange mousse layer is also considerably thinner now. Quite a shame, as I would have much preferred more of it for contrast against the darker chocolate mousse layer beneath. The juxtaposition of these two components was an absolute delight to savour, against the crunchy praline layer as well. The crunch factor of the dacquoise at the base is also somewhat more subdued than what I would have imagined. Much less chopped hazelnuts sprinkled over the pate au dacquoise than I would have expected, though their presence is still hinted through the two halves of roasted hazelnuts as decor. Having tasted it in Taipei no less than 3 times and made it once myself, this Valencia fell short of my expectations of what this beautiful piece would and should be like. To one who is sampling it for the first time, it is still a work produced from very refined pastry making. However, it clearly lacks the vigour, both visually and taste-wise vis-a-vis the “old friend” we once knew. So please bring back the old Valencia, onegai shimasu! 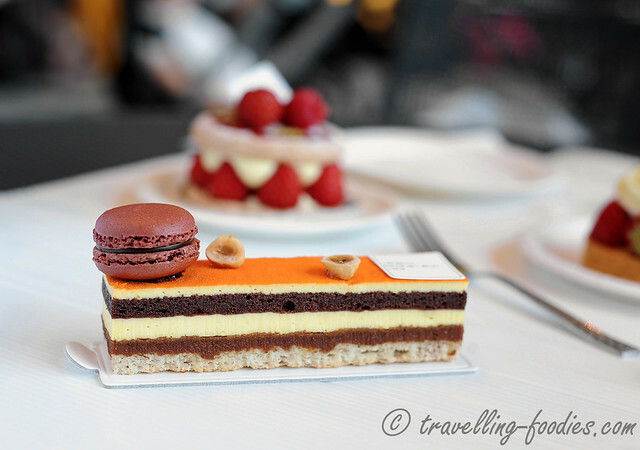 This entry was posted on June 10, 2014 by Alan (travellingfoodies). 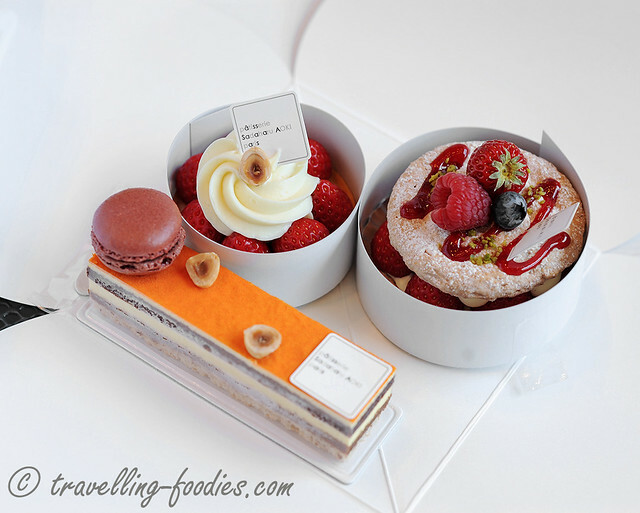 It was filed under Food, Travel and was tagged with entremet, 青木定治, Fraiser, french pastry, Midtown, pâtisserie, sadaharu aoki, Tarte Citron et Fraise, Tokyo, Valencia, 法式甜点, 东京.